Victor Moriyama/Getty ImagesBrazilian protesters carry posters against the far-right’s presidential candidate, Jair Bolsonaro, on September 29, 2018 in Sao Paulo, Brazil. Facebook is battling a wave of fake news and disinformation in Brazil. Business groups have been spreading hoaxes supporting the far-right candidate in the presidential election, and ones study found half of all political content being shared was false or misleading. It shows how Facebook still struggles to police content on its platforms, and the seismic consequences this can have around the world. Facebook is currently battling a deluge of digital misinformation and fake news ahead of a contentious election featuring a bombastic, far-right populist candidate. It’s like 2016 all over again – but this time, the misinformation is spreading on messaging app WhatsApp, which Facebook owns, and the election is in Brazil. Brazil is currently in the middle of its presidential election, which is pitting the far-right Jair Bolsonaro against left-wing Fernando Haddad. 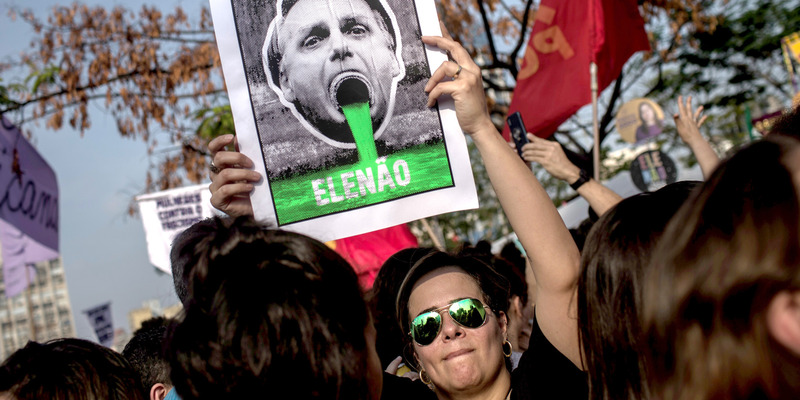 Bolsonaro, who came out in front in a first-round vote but failed to win outright, has espoused extreme, nationalistic views, including opposition to equal marriage, support for torture, and more lethal tactics by police. Unlike in the US, WhatsApp is extremely popular and widespread in Brazil as a standard communication app – but hoaxes and false information can spread like wildfire on the platform. Writing in The New York Times recently, researchers found that the majority of the most popular political content shared on the app in Brazil is either false or misleading. There are coordinated efforts to spread falsehoods, too: Hundreds of entrepreneurs and business groups have been actively pushing pro-Bolsonaro misinformation via WhatsApp via an illegal campaign, according to a report from Brazilian newspaper Folha de São Paulo. There is no easy answer for Facebook. WhatsApp’s messages are end-to-end encrypted, meaning the company can’t view the content and proactively moderate like it might on Facebook’s newsfeed, or on Instagram or Messenger (which can encrypt messages, but doesn’t by default). But this chaos illustrates how – even as Facebook touts improvements in security and preparedness – it still faces struggles in policing unethical behaviour on its services, and the potentially seismic impact this can have on politics around the world. The spokesperson did not respond to Business Insider’s subsequent questions and requests to talk on the record about the steps WhatsApp is taking. In Daniels’ column, he flags a “forwarding” label, new controls for group admins, and a public education campaign among the measures WhatsApp is taking to try and tackle the problem.